Fear of failure as an entrepreneur is a real freakin’ thing. Maybe right now you are afraid of failing in the moment because you're doing something and all of those fears keep popping up for you that this might not work out. Maybe you're thinking of taking the leap, thinking of taking action and the fear of failure is playing over and over in your head. Today I want to talk to you about the fear of failure and how it doesn't have to be your story and I'm going to give you the number one question to ask yourself if you are ready to face your fears. In the beginning, I was almost paralyzed by my fear of failure. I almost did not start this business because I was really scared of what it could ultimately mean for my family. What people would think about me? What would people think about my decision to leave a nine to five to pursue this dream when I had a brand new baby?Would just think I was absolutely insane if it didn't work out? I put a lot of time and energy into this business and I'm so lucky that it did work out, but don't think for a second that those fears of failure, or any fears for that matter, are not constantly coming up. You've probably heard of the saying new level new devil - It doesn't go away, but I've learned a couple of strategies that help me move through that fear faster and that's what I want to talk to you about today. The fear of failure is ultimately keeping you stuck. It's keeping you stuck in this cycle, in this comfortable space. Think about it, fears pop up when we're questioning something. When we're taking a leap of faith, when we're thinking about taking action towards our dreams, that's when fears come up. And so I like to believe that fear is your heart's way of telling you that you are ready and it's up to you to listen to that fear and believe that fear. You can then choose to stay comfortable or to face that fear and see what amazing, beautiful things that you can create in this one life that you have. When you start looking at the fear of failure as your heart being like, “Whoa, let's do this dang thing,” It shifts everything for you. Now, let’s talk about how to deal with fears that are coming up for you at this moment. You know all of those dark hole things that are playing over and over in your head and they're keeping you up at night. Take a moment, get a piece of paper, get your phone out and I want you to write down all of those worst case scenarios. No, seriously do that like right now, like write out your worst case scenarios. Now I want you to look at that list you've just created and I want you to ask yourself, truly, is this really possible? Am I really going to let it get to this place? We make up all these worst case scenarios in our head and we never actually look at them and bring attention to them, but the second that we do, sometimes were like, wow, that's a little ridiculous. That's the power of the mind, man. It could take us into some dark, dark places, but now you have an opportunity, you have a choice. You've seen what is playing over in your mind and you have a choice to say, no, I'm not going to let that happen. I'm not going to let these dark black hole thoughts keep me in my comfort zone and keep me safe because this place of safety of comfort is where so many entrepreneurs either plateau or never get enough momentum to get started and I don't want you to stay there now. Ok, let’s get into the number one question to ask yourself if the fear of failure is something that is truly affecting you. I want you to think of someone that you absolutely admire. Maybe it's somebody in the online space, maybe it's somebody in your personal life. I know for me, Oprah, she basically always comes to mind. I remember being that girl running home from school at 4:30 watching Oprah on TV. Where would you be if Oprah or that person, let fear lead the way? Where would you be if that person didn't take action? Where would you be if that person allowed fear to keep them safe? My guess is that you'd be in a completely different life or situation than you are now and that is exactly my point. It has to be about more than just you running this business. Being an entrepreneur isn't really about you. At the end of the day, it's about the people who need to hear from you. It's about the people who will be impacted by your work. They need you to show up. They need you to get your voice out there. They need you to take action. So think about it. Who is that person who needs you? Even if one person is affected by you, you have made a difference and that creates a ripple effect that then affects somebody else and someone else and someone else. If you start taking action, think about all of the people that will then be affected by that. Anytime that fear comes up, I think about the people I'm able to impact. So where would you be if so and so didn't show up and who are you meant to impact? It's a ripple effect and it starts with you right now at this moment. I know that those fears that are coming up for me are not true, that I can rewrite my story and that so many people need to hear my message. If you are ready to take action, then I want to invite you to my upcoming masterclass. I'm sharing with you exactly how to create a thriving online business that doesn't waste time and energy or have you feeling super overwhelmed. If you're interested in joining us, you can go brandmerrry.com/masterclass. There are countless options on the internet that you can use for list building, sending emails, collecting leads, housing your course, accepting payments, designing, etc…. Seriously, that list goes on and on and on. When I started my business not one single person told me what I should be investing in for my business. I was bootstrapping my buns off so I did a lot of research to find the right platforms that worked for me and my clients. Now three years later I’ve come to love a few specific platforms and tools and recommend them to all my clients. So I thought why keep them to myself - so many of you need this information in your back pocket. 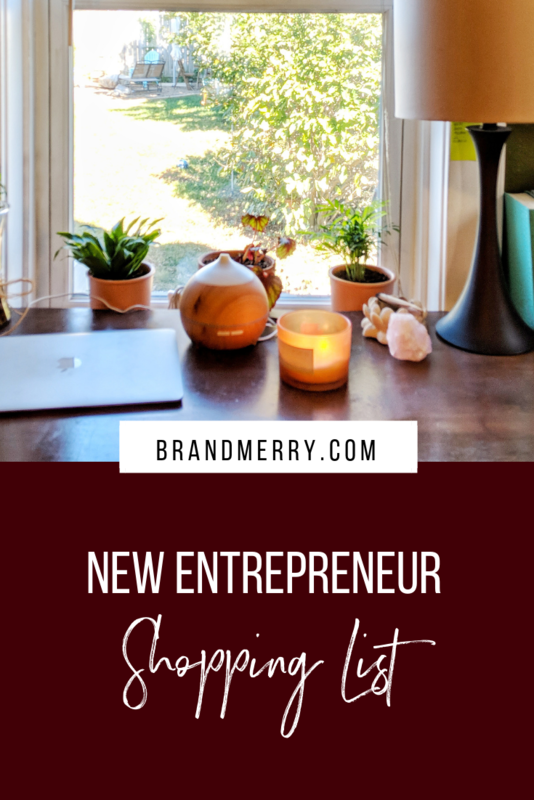 If you’re a new or aspiring entrepreneur read on for my Ultimate New Entrepreneur Shopping List! If I had known about Kajabi from the beginning of my business it would have saved me so many freaking headaches. Now, we are working on moving all my stuff to Kajabi because it can do #allthethings. Kajabi is an amazing platform that allows you to house your website, grow your email list, house your courses and accept payments. It’s now my #1 suggestion for entrepreneurs because it’s that good. The best part is even if you don’t have a course or membership site now you can grow into it. Now, I know it might seem like a scary investment right out of the gate, but when you add up all the individual platforms trust me you’ll spend just as much and end up switching later. You can test out Kajabi for 30 days for FREE. If you’re really bootstrapping or currently loving your website provider, you still need a strong email marketing platform. A community is everything when you are starting out and you NEED to be connecting with them beyond social media. Creating an email list allows you to stay in contact with your audience, build trust with them through consistency and ultimately sell your offers and products, so this is an area you can’t skimp. I love Convertkit because it gives me the high-level segmenting (like Kajabi) without a major price tag. If you’re looking for an email platform that can grow with you, I highly recommend. Get a free trial here. Shameless plug? I think so. Look, I’ve been doing this business thing for a few years now and if there is one thing I see so many entrepreneurs missing it is a step-by-step plan that supports them from start to finish. I know if I had this at the beginning of my business I could have grown even faster. And this step-by-step plan does not mean starting on social media - that’s a big fat NO! It’s following the 5-step roadmap to build a solid foundation, community and so much more. I’m sharing this exact roadmap in my upcoming masterclass, sign up here. It’s no secret that social media is one of the best free tools for growing your business. It’s important when utilizing these platforms (think Instagram, Facebook, Pinterest, Facebook Groups and more) that you are consistent. If you’re currently flying by the seat of your pants and coming up with content every day you’re going to get overwhelmed super quick AND if you’re posting your content once and then letting it drift away into the social media black hole you’re wasting time. Enter SmarterQueue! SmarterQueue allows you to pre-schedule your content across multiple platforms and evergreen your content, meaning you can recycle your posts every few weeks so your great content is actually seen. And finally we get to my favorite topic...organization! Remember when I talked about flying by the seat of your pants and how that just doesn’t work?! Well, there is an easy and free fix to this and it’s Trello. Trello allows you to create boards for your business, organize tasks, evergreen recurring tasks, communicate with team and so much more. I don’t go a freaking day without utilizing my weekly Trello board and have boards for all areas of my life, including our full-time travel schedule. Read more about how I use Trello in my business. There’s a lot of information, tools, resources, etc in the online space (mine included), but it really comes down to finding something that works well for someone else, testing it for 30 days and making modifications. Trust me when I tell you I’ve done the testing and these are my top recommendations and shopping list for new and aspiring online biz owners. Reminder: If you’re just getting started I highly recommend Kajabi so you don’t have to piece it all together and can create a platform that grows WITH YOU! Prefer to watch, instead of read? I’ve got you boo. Head over to Youtube to watch a quick 9 minute video! Do you currently feel super sleazy when it comes to selling? I see you over there not wanting to share your offers with the world. You know you need to get on the phone with people, but then getting on the phone with people and then like freezing because selling has gotten a really bad rap. We all think of the encyclopedia salesman who came door to door or the car salesman who has given us a really bad rap in movies. We think of aunt Susie who is even worse trying to push her product to us through Facebook messenger or through text messenger and it's become a bit overwhelming. I'm telling you though, selling is essential if you want to create a profitable brand. Selling is super important if you want to create a profitable brand and as a branding and business mentor to female entrepreneurs, selling comes up a lot, especially because my audience really wants to create an authentic brand so they don't want to use silly, you know, sleazy sales tactics. I want to share with you my favorite ways to boost your confidence because that's where it really, really lies. It lies in you knowing from the get-go that you have what they need and you feel really confident sharing that with them. At the end of the day, selling comes down to the relationship. Creating truly authentic sales comes from understanding that your audience is human. They are a person and we need to remember that at the end of the day, we are seeing Facebook ads and we are seeing promotions galore and we are seeing popups on youtube or on websites that are all trying to sell us something. Our audience is dealing with the same exact thing and so we really have to be different and that comes down to building trust with your audience. There are so many different ways that you can build trust with your audience. My top way is creating high-quality content, (if you need some inspiration for creating content, you can go ahead and watch some of them on my Youtube channel or see the Blog Resources at the bottom of this blog). Another way of showing up for them is answering questions and inviting them into your world, but at the end of the day, people buy because they trust you. Selling will become easier when you know more about your audience and they know more about you. Think of it as a friendship. If I am your girlfriend and I am telling you about this brand new product that I tried, you're probably going to go to the website and buy the product because you trust me as your friend. The same goes for our audience. When we can approach the relationship as if they are our friend, they're more likely to trust us. They are more likely to buy from us. You're literally showing up genuinely online having conversations with people. It's a lost art that so many entrepreneurs miss, but that is how I have signed every single one of my clients through the power of trust and focusing on the relationship. #2 Believe in Your Offer. If you are creating some sort of program or an offer that doesn't feel true and authentic to you and you don't feel confident and actually delivering that value, it's going to be really hard to sell. That's why one of the things that I work on in my signature program Roadmap to Freedom is all about creating an offer that feels good to you at that moment. Focusing on teaching things or guiding or helping people transform their lives based on what you know right now, not where you want to be in 10 years. If you feel confident in the transformation that you are providing, you are going to want to shout that from the rooftops and that's when those conversations become that much easier. You have more of a take it or leave it approach to selling, which doesn't come off gross, it comes off confident and has your audience feeling like you're not constantly pressuring them. So again, feeling grounded in your offer and what you provide gives you the confidence to share it with ease. One of the easiest ways to make a sale is to actually listen to the human on the other end of the phone, the chat box or the zoom call, by listening to someone and truly understanding where they're coming from and where they want to be, you can more successfully position your offer as the solution. That's ultimately what it is selling is just offering up a solution to the problem. It's offering up the next step. It's removing the pressure of...you have to do this on this day and if you don't do this, all hell's gonna break loose. I have conversations with mentors who do this and feel disgusting when they get off the phone with people. I want my conversations to be genuine and nothing is more genuine than asking someone where they're at and where they want to be and truly listening to what they have to say and then with full confidence knowing you can support them at the end of the day. It really comes down to having a strong relationship with your community, feeling super grounded in your offer and listening to what the person on the other end really has to say because when you can do that, you're setting yourself up for major success, not just in your business but also with the clients you work with and the results that they will get. If you are a coach, a consultant or a mentor and you want to learn my four proven ways to sign your next high level one on one client than I made you a free video training sharing the exact four steps that I used in my business in the very beginning to sign my first four clients and celebrate 15k cash in my business with a list under 100 people. Real quick before you go, I have to share some exciting news with you. My signature program, Roadmap to Freedom is back and it is better than ever. We have made it more accessible to new and aspiring female entrepreneurs by adjusting the price point of the program because it is my personal goal to help more female entrepreneurs create their dream business so that they can experience true time, financial and location freedom. At the beginning of my business, I remember what it was like feeling super overwhelmed, not sure exactly where to start, not sure what to work on next that what would lead me to profitability. So I created a program that would do just that. Roadmap to Freedom is a step-by-step program that walks you through everything that you need to create a profitable brand and make money on your terms. You can learn more about the program, read amazing case studies and testimonials at brandmerry.com/freedom. Prefer to watch, instead of read? I’ve got you boo. Head over to Youtube to watch a quick 12 minute video! As an entrepreneur, one of the worst things that you can struggle with is having shiny object syndrome, or as I like to call it, s.o.s. It is so hard to move your business forward if you're constantly jumping from idea to idea, project to project or worse, never actually completing anything. And honestly, it can be detrimental to your business and kind of your sanity as well. It can feel overwhelming not knowing what to work on, feeling really caught up because you're not able to focus. And if you are struggling with this, know that you are so not alone. So many entrepreneurs struggle with focus and productivity, and that’s what I want to talk about today. If you don't know a lot about my story, I started my business with a one-month-old baby. I quickly returned to work two months later was working a nine to five, figuring out this whole mom thing and launching this business from scratch. So optimizing my time, being really lasered in and being productive when I was working on my business was so, so important. I hear from entrepreneurs all the time about the lack of focus, the lack of productivity, not actually feeling like they are moving their business forward in a way that is allowing them to break free from their nine to five or support their family or travel the world..Whatever that desire might be for you. Today, I wanted to chat with you about my favorite tips for improving focus, especially as an entrepreneur. The first thing that you need to know when it comes to focus is that focus is a habit. If you don't currently have a great method for focusing or you feel like you have squirrel brain (you're all over the place), then it has to be a conscious decision that you make. To change this habit, you have to make the decision now and create an awareness around it so that you can start flexing that muscle. I often say that focus and productivity is like a muscle. The more that you do it, the more that you practice it, the stronger you will actually become. It's really easy to stay in this same cycle, to stay in a bad habit. It's like a wheel you're constantly on over and over and over again until you make the conscious decision that you're going to step off of that. The same goes with the habit around focus. If you struggle with this, then you have to be super aware and on it, on those moments when you're not lasered in and focus and pull yourself into that different mindset. Every single thing that you will create around a new way of focusing and productivity will require daily action on your part. It can be really easy to slip back into old habits, but I really encourage you to make the decision now to start taking those small actions and you will eventually see that this just becomes second nature to you and you're able to not just get more done, but actually be productive in your business. Your girl right here constantly, has ideas. And if I just let those ideas flutter around in my brain, I would always feel overwhelmed. So the key that I have initiated from the very beginning is a brain dump. Like didn't we all learn how to do this in elementary school? We're getting ready to write a report or write a short story and we have to do a whole brainstorming session. That's exactly what you're doing here. I call it a brain dump because we're taking everything that's going on up here that's driving us freaking crazy and we're dumping it into a list and getting it out of here so we can focus on what we actually need to do. If you are a creative entrepreneur or a creative person than I know those ideas are constantly coming at you and you can't quite figure out which one you should be focusing on to actually see results. The spinning, the constant spinning back and forth is what's keeping you stuck because you can't see a clear plan of action to get from here to here. Oftentimes those ideas that we have might not be right for this moment, but we're so hung up on him. We're so clouded by all of the ideas floating around in our head that we can't actually map out our own step-by-step. So getting these ideas out on paper; I prefer to use Trello for this. You can do a complete brain dump in Trello to get you started and you'll be able to see with your eyeballs the things that you need to do and the things that aren't needed in this moment. My tip for you, after you do this brain dump, is to actually pull out the pieces that are going to make the biggest impact for you in the next 30 days. This is a great habit to start getting into because you're looking at the bigger picture of your brand. I'm not going to overwhelm you and be like 90 days out. Like let's just focus on 30 days at a time. By brain dumping all of that information, pulling out the pieces that you think are going to be the most important in the next 30 days, and then starting to prioritize. Again, I love Trello and for this next step after our initial brain dump, I recommend using some sort of tool like Trello. There's also Asana out there, monday.com, tons of options for you, and organizing those individual pieces into smaller actionable steps. In the beginning it's gonna feel like snail-like motion, but eventually you're going to really create a rhythm. The only way to do that is to actually get clear on all the little bitty nitty gritty details that you actually need to do in your business. With each of these individual projects that you have prioritized, I use Trello to create different cards for those projects and add in all the tiny steps. The key here is for you to take that big idea and break it down into all the tiny little details that are going to help you get that done. Remember, it is in the small actions, we start to feel really overwhelmed when we're just looking at one big task and we're like, how do I get there? What do I need to do now? And we're Ping ponging around. If you can break it down into these small little actions, put a little checkbox next to it when you are completed with it and know that, oh if I do all 10 of these things, I will get that done. Okay, let's talk about scheduling your time. I know you're an entrepreneur. I know that you decided to break free from the nine to five life or maybe you've gone part time or whatever because you want complete control of your schedule. You still need to use a calendar. I don't care if you are an entrepreneur, I don't care what you're doing. You need to embrace your calendar by giving yourself time to schedule out these individual task is going to save you so much time and energy in the long run. Remember, you don't always have to be scheduling every tiny little detail as you start to create this habit, but especially in the beginning, I want you to start scheduling and time blocking all of those individual tasks. If you caught my post last week where I talked about content creation and the four tools and tips that I use, I talked about batch scheduling. This is also something that you need to get into the habit of scheduling, not just the tiny little parts, but also those batch scheduling sessions that you use in your business, whether that is creating content, filming videos, engaging with your audience. Start putting those in your calendar as well so you can really see where you need to be laser focused and on which project and where you a little bit more breathing room and flexibility. So again, being your most focused and productive self is a habit that you have to practice. You have to flex that muscle. These tips are what's really going to help you get started in creating this habit. Remember, we need to get all of those ideas out of your magnificent brain, onto a piece of paper or some sort of computer software so that we can start strategizing how you're going to move forward. After the brain dump, you want to identify the most important pieces, the ones that are going to have the biggest impact in the next 30 days. Then you went to breakdown each of those individual tasks into tiny little actionable steps and get them on your calendar. This way, you know every single day what you're working on, where your energy and focus needs to go and you know and you trust that each of those small actions is leaving to the bigger goal, the bigger picture and your business. Another thing that I absolutely encourage you to do is use something that allows you to take multiple breaks. One of the ways that you can increase your focus and productivity is not staring at a screen for like eight hours. Get into the habit of taking frequent breaks while you're working on something every 50-60 minutes is usually a good mark, but if you're the type of person who needs every 30 minutes to get up, walk around, meditate, do something, then go ahead and do that. My favorite thing to use is those little cute productivity cubes and finally one of my brand new favorite tools that I absolutely love is called habit lab. It is a chrome extension and it monitors the time that you've spent on various platforms. Nothing will break your focus more than your inability to walk away from Gmail or your horrible obsession with spiraling on Facebook. If you find yourself wasting tons of time on Facebook or Instagram and Gmail, then you are missing out on your focus and your productivity and therefore you aren't moving your business forward. Putting a chrome extension onto your browser is going to help you get into that habit of not going to that platform every time you have a little bitty break. Utilizing these tools is only going to help you, you guessed it, flex that focus muscle. You want regular tips and tricks on productivity. Be sure to follow me on Instagram at instagram.com/brandmerrycoaching. I'm talking about all the behind the scenes of how I run my business, how I manage being a mother, how we're traveling full time, how I work with my husband, the communication that needs to happen. It really comes down to being super productive. Don’t forget to grab my free content planner, which will support you in improving the focus when it comes to creating awesome content! You can get that at brandmerry.com/contentcalendar.